We delivered our last CSA box on October 10 and we’d like to thank all members for joining us for the season. Like all seasons, there are ups and down, but, overall, I think it was a great year. 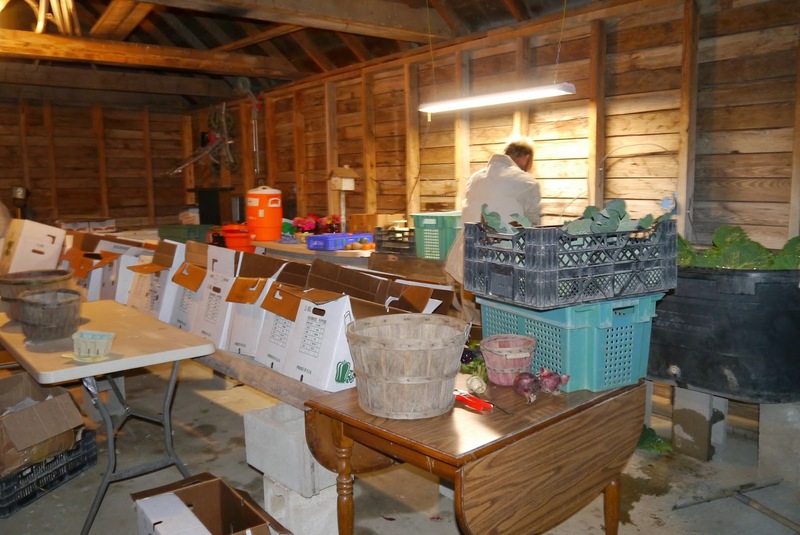 We hit a lot of milestones on the farm such as getting certified organic, becoming authorized to accept EBT, and building our deep winter greenhouse. We also hit our largest number of CSA members ever in 2014, delivering 40 boxes week in and week out. All told, I’m pretty tired with a number of fall chores yet to tackle. I wish everybody a restful winter and hope to hear from you in the spring. Wow, what a difference a day makes. We spent yesterday planting garlic and harvesting for the box in the 60’s with full sun. This morning, I had to plunge my hands into water at a temperature most commonly found off the shores of Antarctica. Every so often I was able to stop shuddering today, and, looking around, found some beautiful sights. The colors on the trees right now are incredible and it’s wonderful to see how even the weeds and grasses I curse all summer color with autumn hues. The birds on the farm are taking turns bolting upwards in the strong winds, and, I also appreciate seeing our wind turbine spinning away – we’re really making a lot of power today! As we edge into fall, we’re turning our attention ever more to finishing our winter greenhouse. Right now we have a lot of rafter up, which is great because we feel like we’re making real progress. For a long time, the whole project was just a big pit in the ground with some rocks in the bottom, but it’s starting to take shape. Next we’re shoveling in a one-foot layer of sand for the radiant floor tubing. Leave a comment It got cold out!